"Zionist heroine Hannah Senesh was remembered in Budapest on the 63rd anniversary of her execution. 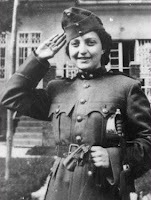 Senesh was executed by Hungarian Nazis on Nov. 7, 1944 [aged 23] after parachuting behind enemy lines during World War II and being arrested as a spy. The memorial ceremony was organized by the Budapest Holocaust Museum and Documentation Center in the Hannah Senesh Park, named for the Budapest-born Senesh who as a young girl immigrated to Palestine and served during World War II as a British soldier, parachuting first into Italy and Yugoslavia, and then into Hungary in 1944. Two of Senesh's Hungarian cousins took part in the ceremony, as well as Israeli Embassy First Secretary Yahel Vilan, representatives of the Budapest Holocaust Museum and members of the Hungarian Jewish community. No Hungarian officials attended the ceremony." Blessed is the heart with strength to stop its beating for honour's sake. 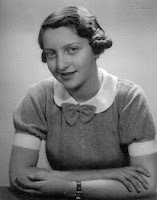 Hannah Szenes was a Hungarian Jew, one of 37 Jews living in Palestine, now Israel, who were trained by the British army to parachute into Yugoslavia during the Second World War in order to help save the Jews of Hungary, who were about to be deported to the German death camp at Auschwitz. Szenes was arrested at the Hungarian border, imprisoned and tortured, but she refused to reveal details of her mission, and was eventually tried and executed by firing squad. She is regarded as a national heroine in Israel, where streets are named after her and her poetry is widely known.